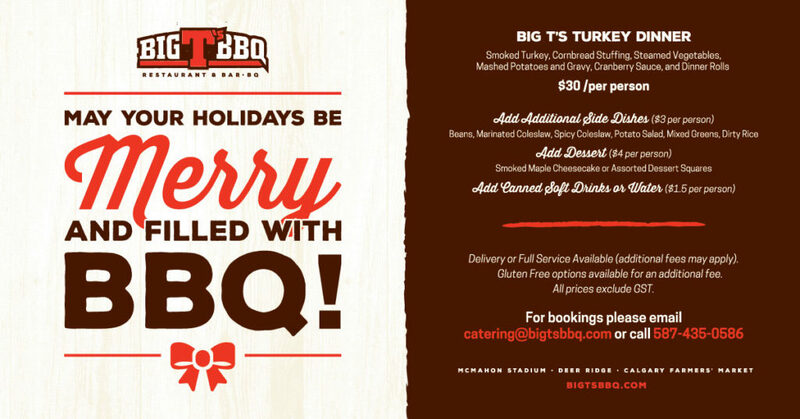 Whatever you're in the mood for, Big T's has something to satisfy. Choose a menu and see what we mean. Plus, 90% of our menu items are gluten free! MAY YOUR HOLIDAYS BE MERRY AND FILLED WITH BBQ! Brunch every Saturday and Sunday from 10 am – 2pm. Lunch every Monday through Friday 11am – 4 pm. Replace bacon with brisket, smoked chicken or pulled pork at no additional charge. Check out our featured "You Gotta Eat Here" menu items. Healthy options that don’t skimp on flavour. All salads served with cornbread. All sandwiches are served with your choice of one side. Each rack is individually rubbed with our signature dry rub and smoked in our Southern Pride Smoker from four to six hours. How Do You Wanna Get Sauced? Choose one of our four signature BBQ sauces, all gluten-free! All rib plates are served with your choice of 2 sides and cornbread. All plates are served with your choice of 2 sides and cornbread. Deliciousness that will have you feeling all cozy inside. Looking for someone to cater an event? The cornerstones to any delicious meal. Bourbon (1 oz) The official beverage of BBQ! Served warm with vanilla ice cream. Perfect for sharing! All kids meals are served with one side, a drink and your choice of ice cream or jello for dessert (12 and under). The crispy, golden brown kids classic. L'il T's BrunchEvery Saturday and Sunday from 10am – 2pm! Your order request has been submitted.